.. Which also marks my first day as a certified make-up artist and hair stylist! I can not believe the 8 weeks has already past, it went by way too fast. The past eight weeks has been some of the most stressful, hard and difficult weeks in my life, yet they have also been some of the absolute most fun, exciting, active ones and also the ones where I have probably learned more in such a short amount of time than ever. It is a hard education, it takes courage to take the leap because you really have to believe in yourself, which I usually never did with anything education wise, because I was not sure about it - with this, I was .. I am! I have so many future plans, so many days already planned out for practice, this is an education that never ends, you have to stay up to date with trends, styles, new techniques and so on. It is never just, "alright you passed, you're such a professional now", which is probably one of the things I love the most about this education - I get to learn new things for the rest of my life. 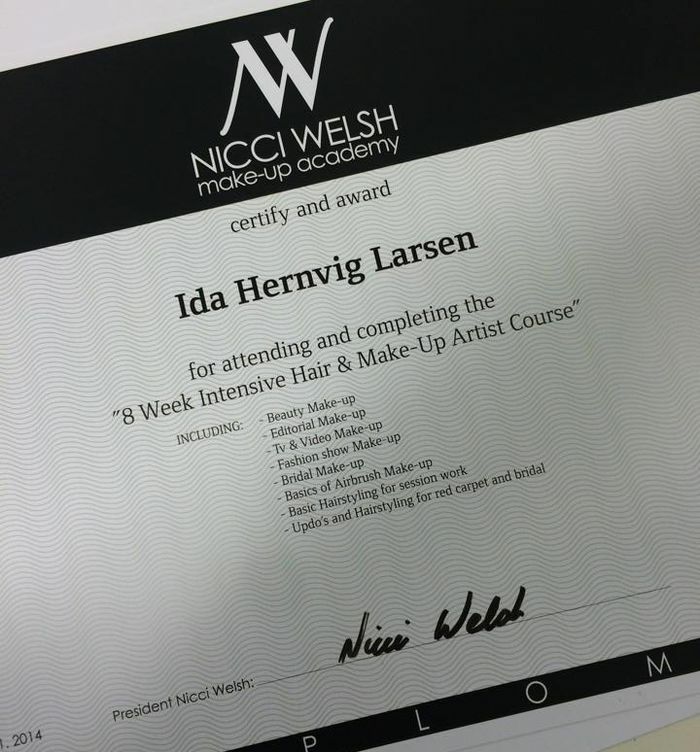 If you are from Denmark and you have a dream about becoming a make-up artist and hairstylist I will definitely reccomend Nicci Welsh Make-Up Academy. I am so grateful for all they have taught me, for the sweet teachers who were to get to know us and what we wanted to get out of this and for Nicci who has supported us all and who showered us all with good luck and compliments on our work today. She has been there during the whole journey, she was the teacher for a couple of the days and she was always there if you needed to talk to her. It was really emotional to say goodbye to the other students, the teachers, Nicci and the school today, because these past 8 weeks has been so intense and we have all helped each other so much, it is going to feel odd not to see these people from Monday-Friday anymore. I am sure I will probably see most of them again in the future though, who knows what it holds!